Frigid temperatures, pressurized air, and lots of water; all the things needed to produce snow when the weather is not cooperating. 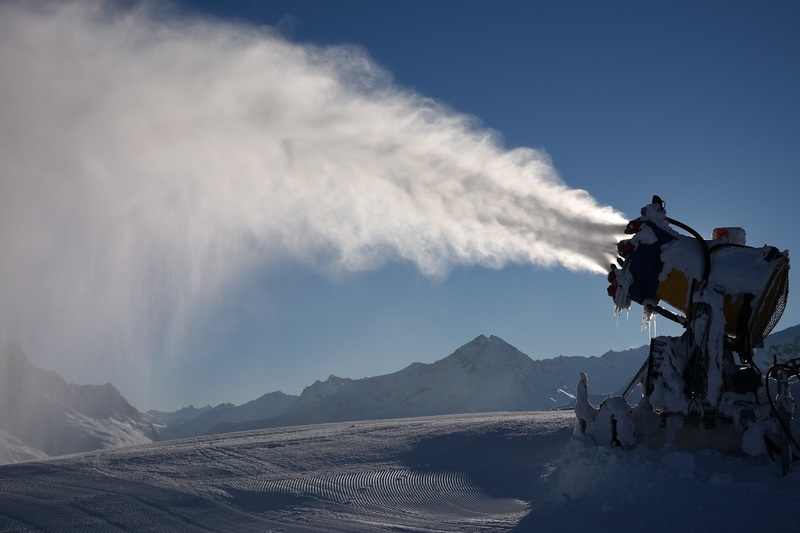 By forcing water and pressurized air through a "snow gun," or "snow cannon", ski slopes locally and around the world can be covered by man-made snow. Snowmaking is mainly used at ski resorts to supplement natural snow. This allows them to improve snow coverage on certain trails and to extend their season from late autumn to early spring. The production of snow requires freezing temperatures. Wet bulb temperature (the lowest temperature that can be achieved by evaporative cooling of a water-wetted or even ice-covered, ventilated surface) is used as the standard since it takes air temperature and relative humidity into account. Some limitations do apply. Snowmaking is a relatively expensive process in its energy use, also water is in great demand and is usually pulled from run-off ponds. In drought years, it is not unusual to run out of water before the real snow arrives. Art Hunt, Dave Richey, and Wayne Pierce invented the snow cannon in 1950. Wayne Pierce was a ski manufacturer in the 1940s, along with his two partners, Art Hunt and Dave Richey. All three formed the Tey Manufacturing Company of Milford, Connecticut in 1947 and sold a new ski design—an aluminum metal ski with a hollow interior and three layers of metal bonded together. Two years later, the company was hit hard by a winter without snow, which caused an obvious slump in ski sales. With such a major problem at hand, Wayne Pierce came up with a solution. On March 14, 1950, he arrived at work and exclaimed, "I know how to make snow!". He had the idea to blow water droplets through freezing air, causing the water to turn into snowflakes. Using a paint spray compressor, a nozzle and some garden hose, Pierce, and his partners invented the machine that made snow. In 1952, Mohawk Mountain Ski Area in Connecticut became the first in the world to use man-made snow by implementing Tey Manufacturing’s invention. The company didn’t make snow for long, however. The three partners sold Tey Manufacturing and the snowmaking machine's patent rights to the Emhart Corporation in 1956. Since 1952, research and development of snowmaking technology have provided great strides in the industry. These are the machines in use today. Internal mixing guns. Water and air are mixed together in a chamber and forced through jets into the air, descending as snow. These guns are typically low to the ground, on a stand and require a lot of air to compensate for the short time the water is airborne. Some newer versions are taller and use much less air because of the increased time to the ground. The amount of water flow determines the type of snow that is to be made and is controlled by an adjustable water valve. External mixing guns spray water from a nozzle as a stream while other nozzles shoot air through the water stream to break it up into water particles. Internal nucleators help create a nucleus for the water droplets to bond to as they freeze. External mixing guns typically rely on a longer hang time to freeze the snow. This allows for much less air use. High water pressure is a necessity to operate this machinery correctly, so the water supply is opened completely, though in some the flow can be regulated by valves on the gun. Fan Guns are different from all other snowmaking guns because they require a power supply to engage a fan as well as an onboard air compressor. Compressed air and water are forced out of the gun's drum through an array of nozzles (there are several different arrangements). Fan guns have anywhere from 12 to 360 water nozzles on a ring on the front of the gun's drum. The fan blows air through the drum to create a mist, which then crystalizes from its long hang time, due to the force of the fan. Snow Lances can be up to 12 meters long and are vertically inclined aluminum tubes. At the head of each lance is placed a water and/or air nucleator. Air is blown into the atomized water at the outlet from the water nozzle. The compressed air expands and cools, creating ice nuclei on which crystallization of the atomized water takes place. Due to height and the slow rate of descent, there is enough time to complete crystallization. This process uses less energy than a fan gun but has a smaller range and lower snow quality. Snowmaking has achieved greater efficiency with increasing complexity. Traditionally, snowmaking quality depended upon the skill of the equipment operator. Today, computer control helps optimize that skill with greater precision, such that a snow gun only operates when snowmaking conditions are optimal. Editor’s Note: At this writing, we are still looking for Mother Nature’s great holiday snow dump, and are total believers that we will be enjoying it by the time this article is in print! When it comes to measuring snow and precipitation, Donner Summit offers the gold standard in California. The measuring year begins on October 1 and ends September 30, with statistics going back into the 19th century. Thankfully, someone decided early, that it might be important to keep track! Located at Donner Pass in the Sierra Nevada, the Central Sierra Snow Laboratory (CSSL) is a research field station of the University of California, Berkeley specializing in snow physics, snow hydrology, meteorology, climatology, and instrument design. Built in 1946 by the (then) U.S. Weather Bureau and Army Corps of Engineers, it is administered by UC Berkeley's California Biodiversity Center. CSSL has a close to complete and consistent record of precipitation, snowfall, snow depth, and air temperature for the periods of 1946-1952 and 1957 to the present. The Lab also has long-term data sets on wind speed and direction, solar radiation, snow temperature, relative humidity, and soil moisture. 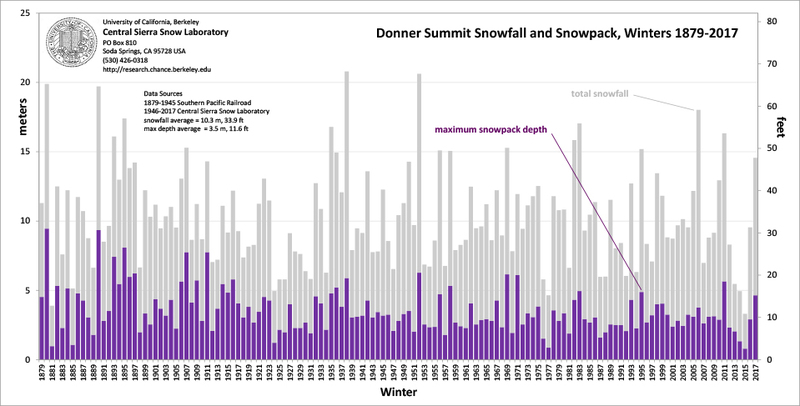 In addition, precipitation and air temperature records from other locations on Donner Summit are available. Our thanks to staff member Randall Osterhuber, for sending along the updated chart for our readers. It becomes a tradition creating excitement for the new snow, upcoming holidays and another wondrous ski season in the Sierra. If you think the earth is shaking below you — you may be right. In the Lake Tahoe-Truckee region the Sierra Nevada mountain range is moving northwest with the North American Tectonic Plate, about one half-inch per year. This movement is paired with its transform plate boundary: the Pacific Tectonic Plate, moving southeast about 2-3 inches per year. Most of us know that when the plates grind together, the fault lines in certain areas begin to crack and fissure farther. But it does not occur all at once. A local series of earthquakes caused by the earth’s crust movement is known as an earthquake swarm. Recently, earthquake swarms have become commonplace for the Sierra Nevada. In August 2008, Mogul, a suburb west of Reno, was hit with weeks of small-magnitude quakes, which surrounded a 5.0 temblor and caused around $1,000,000 of damage. In July 2014, a swarm in the northwest region of Nevada, near the Oregon/California border, again lasted weeks with a total of around 800 quakes. The two largest measured 4.7 magnitude. This swarm fortunately occurred in a low population area and didn't cause sizable damage. The Truckee area is in a very active fault zone. 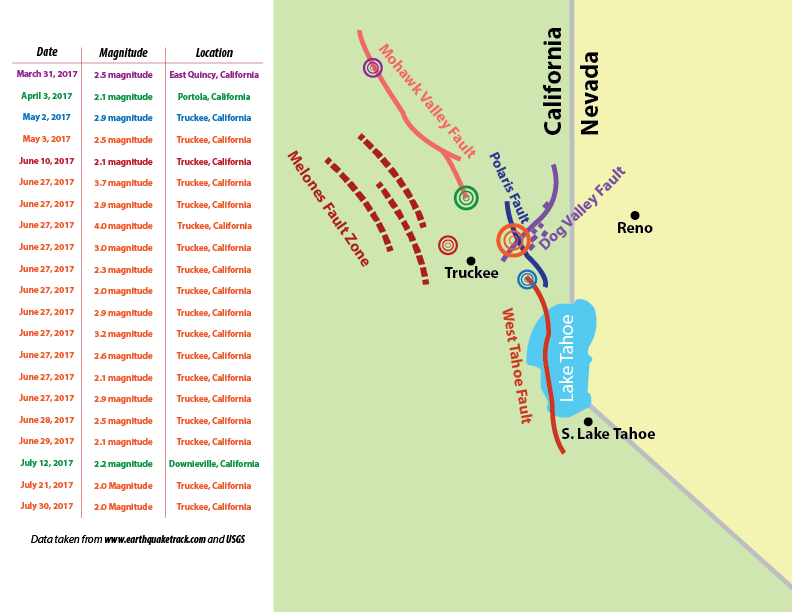 On June 27 – 29 of this year, Truckee experienced an earthquake swarm which surrounded a 4.0 magnitude quake. Most of these temblors occurred on the intersection of the Polaris Fault and the Dog Valley Fault. (See diagram.) Twenty-eight small quakes were recorded on just June 27, while the largest hit at 2:09 a.m. that day. A possible cause of the swarms in our area may be more than just tectonic plates moving. Some researchers believe it may also be due to the epic amount of water added to the ground water table in the Sierra Nevada, after last winter. “Hydrological changes do not need to be sudden or large to change the water pressure in a fault zone. As aquifers are depleted for irrigation, the water table slowly drops, which may also trigger earthquakes. It is thus unsurprising that extreme rainfall events might also encourage earthquakes,” stated Gillian Foulger, Professor of Geophysics, Jon Gluyas, and Miles Wilson, Ph.D. student in the Department of Earth Sciences; all of Durham University in England. In essence, the added ground water works as a lubricant for earth movement. Researchers have also seen increased fault movement with snowmelt in late spring and into summer in countries other than the United States. A second possibility for earthquake swarms is also related to water. Earthquake trigger studies have been done measuring the depression of soil caused by water content during winter months; called seasonal water loading. In a typical winter, the soil may condense to about one centimeter. The trouble begins when the soil starts to dry out and expand: rebounds that cause stress on the faults leading to upticks in small magnitude earthquakes regionally. "It's not like we're seeing an earthquake season, but the timing of this water unloading is when we're (historically) getting more earthquakes," said Chris Johnson, a graduate student at the Berkeley Seismological Laboratory. It seems we also don’t know how many factors are at play when an earthquake occurs, but the research continues. What Is The Amgen Tour De California? Two stages in The Tahoe Area. (below are the stage maps). Below are Pictures of the riders descending Kingsbury Grade in the last leg of Stage 2. 1. A low-pressure system, warmer air, is pushed down towards the earth’s surface, while a high-pressure system, cooler air, moves over and traps the warmer air; this is most common after a storm. 2. The air near the ground rapidly loses its heat on a clear night. In this situation, the ground becomes cooled quickly while the air above it retains the heat the ground was holding during the day. 3. 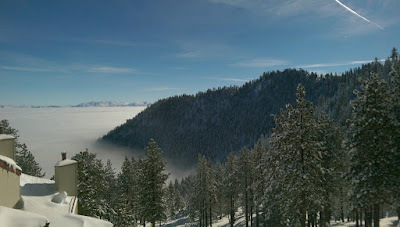 Topography can also play a role in creating a temperature inversion. Cold air can flow from mountain peaks down into valleys. This cold air then pushes under the warmer air rising from the valley, creating the inversion. Inversions can also form in areas with significant snow cover because the snow at ground level is cold and its white color reflects almost all heat coming in. This means the air above the snow is often warmer because it holds the reflected energy. In and around the Tahoe Basin, this can happen usually after storms and is evident in local valleys on a small and large scale. You can see examples of this when you drive on Highway 267 from Truckee to Northstar in the early morning. There is usually fog low to the ground in the surrounding Martis Valley. On a larger scale, Reno, Nevada in the Truckee Meadows is constantly experiencing inversion layers over the city. This occurs in the weeks after a winter storm or when cold air from the Sierra crest settles in and pushes the warm air up, causing the inversion. This can mean clouds and no direct sunlight from days to weeks! Directly: the buildup of moisture due to the inversion layer can cause early morning fog on your way to work or that pesky frost you must scrape off your windshield of the car before even beginning your commute. Indirectly: An atmospheric stabilization can lead to a concentrate of pollutants like car exhaust and wood fireplace smoke. Long periods of an inversion layer can cause thick smog to form in the Lake Tahoe Basin and Truckee Meadows. Trapped smog can cause winter allergies and make existing asthma symptoms worse. Studies have shown that increases in particle pollution in the air, like those from fossil fuels, lead to more hospitalizations for children who have asthma. What’s a Kid (AdultsToo…) To Do? Go skiing, sledding, hiking, snowshoeing or any other outdoor activity at higher elevations. Get above the clouds to breath in the fresh air. Your lungs will love you for it. What if I told you that you have been lied to for years? Well its true. Bears aren't hibernators they enter torpor instead. Torpor is the short-term reduction of body temperature (for bears, up to 100 days). Torpor is controlled by ambient temperature and food availability or, in a bear's case, energy stores. Torpor allows a bear to regain consciousness in a matter of seconds and be ready for action (running, attacking, eating, etc). For animals in hibernation, on the other hand, it may take hours to days, to gain back the energy they had before they began their long sleep. How do Bears Survive During Torpor? Bears prepare their dens well before they need them and rarely use the same den two years in a row. Once they settle down for the cold months, their bodily functions change greatly. The flow of blood becomes concentrated to the heart, lungs and brain. The bear is then further protected from the cold by their fur and up to four-inches of fat under the skin. The digestive system shuts down while asleep as no water or food is entering and waste is not exiting. The bear still needs sustenance every day consisting of water, protein and 4,000 calories. The animal’s energy stores provide this through its own metabolic system. Fat is broken down into calories and water, and muscle is broken down into protein and Nitrogen Urea. Nitrogen Urea is normally highly toxic in an animal’s system but a bear’s metabolic system recycles this through the liver and kidneys to produce amino acids. Those attach themselves to muscle tissue and are broken down into protein yet again. What can Wake a Bear from Torpor? A bear’s torpor is a lethargic state in which it can awaken from in just seconds. Loud noises such as trees falling, avalanche blasting caps or even a garbage truck can wake a bear from torpor. Here in Tahoe and Truckee we have bears that do not to enter torpor at all and roam our neighborhoods looking for food all winter long. Our civilization in their habitat has changed the way they expect food and thus changed their torpor and breeding patterns. I have recently seen a few bears in a couple of neighborhoods in South Lake Tahoe and Stateline. At this time of year, they are desperately looking for a den and food. Remember to always put your trash in a secure location: bear box, your garage, or indoors. Remember also to double check that you have secured your doors and windows. As for wilderness areas, just be cautious. For those of you who go out and cut your own Christmas tree with a permit, be loud and aware in your surroundings to avoid surprising a bear. If you see a bear in a populated area this season don’t approach it; it is probably hungry and defensive. You can always call #911 in an emergency or the Tahoe Bear League 24/7, at (530) 525-7297. Also, visit their website to learn more about their amazing organization, http://www.savebears.org/.